The code behind the Google doodle celebrating Alan Turing’s 100th birthday is now up on Google code. This animated logic puzzle game appeared on the Google homepage on June 23, 2012. If you missed it, you can still play it in the doodle archives. 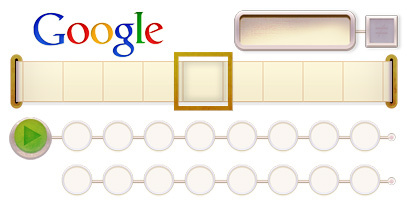 Our doodle for Turing's 100th birthday showed a live action Turing Machine with twelve interactive programming puzzles. Turing Machines are theoretical objects in formal logic, not physical things, so we walked a fine line between technical accuracy and accessibility. We focused on finding a good representation for programs and choosing puzzles of appropriate complexity. We did considerable user testing and iteration, more than for any past doodle. Please enjoy, and feel free to extend and improve the code. Can you think of ways to generalize the game? We have filed some starter issues to whet your appetite. If you are interested, hack away, and we’ll happily review your changes!